really means to be a sky pirate and to learn from his father. But Wind Jackal is consumed by his desire to capture Smeal—and his judgment is flawed. His actions endanger the lives of his crew and his son. 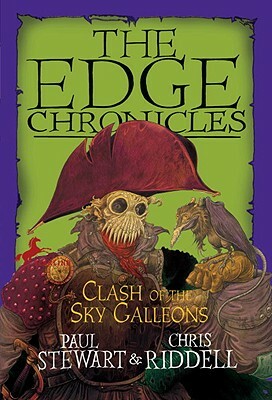 As they travel from the taverns and backstreets of Undertown and the wonders of the shipbuilders' yards, to the dark dangers of the Deepwoods, where Quint and Maris become separated from the rest of the crew and encounter some terrifying creatures and finally to the mysterious, ghostly sky-wreck in Open Sky, where they discover the truth about Smeal—and face a new terror. . . .
Paul Stewart is a highly regarded author of books for young readers, most notably the bestselling Edge Chronicles and the Far-Flung Adventures. He lives in Bristol, England. Chris Riddell, co-creator of the Edge Chronicles and the Far-Flung Adventures, is an award-winning illustrator and political cartoonist. he lives with his family in Bristol, England.